During a post game night on the tiles after Connacht’s win over the Dragons a couple of weeks ago, one of the lads in the crew asked where did a particular player who was introduced play at schools level. We were stumped and it raised a further question for me on which second level schools were feeding the provincial and ultimately national senior teams setups? 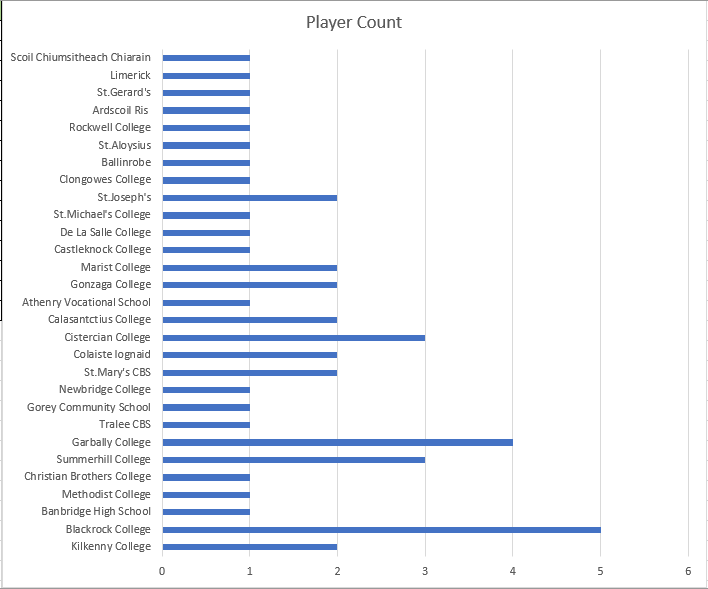 This blog series will look and recognize the secondary schools who are to the fore in underage rugby player development. They are at times the forgotten piece of the jigsaw. Without second level schools, there would be no talent pool outlet for local rugby clubs, professional provincial and national team setups. This opening article focuses on Connacht Rugby. The statistics are based on the indigenous born players who have come through the Irish or Northern Ireland educational system. The statistics may surprise some but it is an exercise which provides key trends going forward. The Irish born player age profile in the squad is around twenty-six years. The current first team squad’s eldest player is Robin Copeland (31). The playing squad has a good blend of youth and experience. The emergence of academy talent such as Conor Fitzgerald, Colm De Buitlear this season bodes well. Paul Boyle as well has burst onto the professional rugby scene this year and with astute coaching from Andy Friend and staff, optimism abounds in the Sportsground. The local rugby club scene is well represented in the Connacht Rugby squad ranks with Corinthians, Galwegians and Buccaneers forming a good chunk of the squad currently. The conveyor belt of talent from the Dublin school system is self evident in this squad makeup like in the other provinces. Blackrock College (5), Gonzaga College (2), De La Salle (1), Castleknock College (1), St.Michael’s (1). Connacht schools are also well represented in the squad makeup. Garbally, Summerhill, St.Joseph’s provide nine players to the current playing squad. The emergence of rugby talent in areas not typically associated with the game is seen in this schools breakdown. Ultan Dillane attended Tralee CBS (Kerry). Colm De Buitlear hails from Connemara. Matthew Burke from Ballinrobe. A pleasing trend for rugby union player development within the province. With the November international series out of the way for another year, it was back to the brass tax of Guinness Pro 14 action; a round of fixtures which exposed team priorities, squad depth issues and worrying form for teams as they face into the second tranche of European games. Hawkeye Sidekick reflects on the action. There were a couple of standout teams in this round. Munster Rugby’s opening half performance against an under strength Edinburgh Rugby caught the eye. The Leinster Rugby juggernaut containing numerous academy and fringe squad players continued their ruthless try scoring exploits on the road to the Dragons. Connacht Rugby’s road trip at Bloemfontein has to be called out too but it is Glasgow Warriors win over Scarlets that is the defining display this weekend. When the hosts were reduced to fourteen players after Alex Allan’s red card early, it looked like a long day at the office for the Warriors but instead of contain, they produced a quite scintillating second and third quarter performance with two eye catching tries. Thomson lights out with the boot against a Scarlets which was loaded with first team players. A massive statement of intent. The Moyross native helped himself to a eight minute hat-trick. The opposition may not have being up to much but take nothing away from the running lines and try scoring execution on show for those tries. Earls oozed class every time he picked up the ball. Munster Rugby’s running lines and offload game was a joy to watch and this has to be the template for the side going forward. 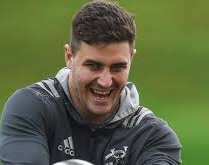 Chris Farrell was incredible with his ball carrying duties and what a boost it is for Munster Rugby to have the Tyrone native back in the squad again. A couple of weeks, I hated to point out that Dragons head coach Bernard Jackman was under pressure after an abject road trip loss to Connacht Rugby. A timely win last time out against Edinburgh Rugby looked to have eased those concerns but the manner of their home loss to Leinster Rugby has seen massive negative reaction from Dragons supporters. Dragons were second best on all facets of play; their defensive line speed and organization was labored and the young Leinster Rugby players on show were only too grateful to exploit the space. 50+ points again and the pressure is back on Jackman. Dragons is a project in progress but the manner of these defeats is a massive concern. The board will need to be strong here but Jackman could be increasingly isolated from the fan base which could spell doom. There was big disparity in certain team selections this weekend. Leinster Rugby’s side was without numerous first team personnel but it did not matter as they trounced Dragons showing their incredible squad depth. However, other team’s squad depth is not as strong and for Edinburgh Rugby, it was a chastening experience in Cork on Friday night. Munster Rugby were rampant throughout and the three quarter and ten channel was isolated throughout. 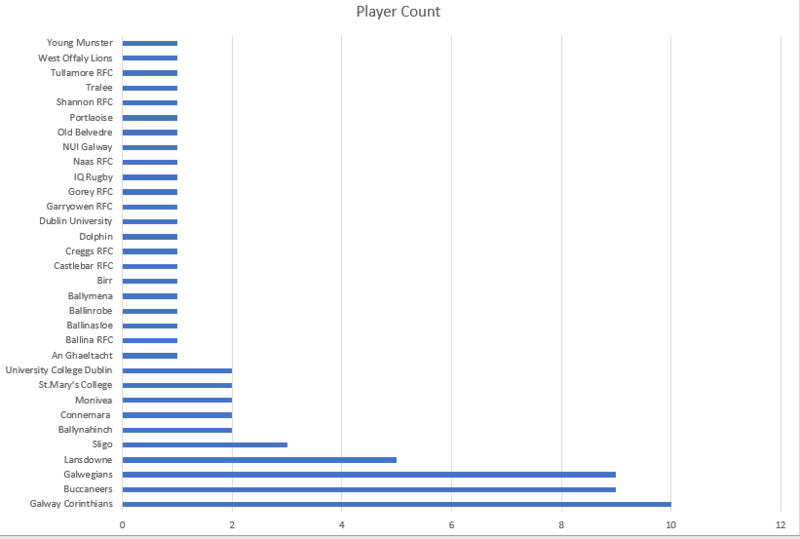 The tournament has seen quite a few representational team selections in preference for bigger fixtures in recent rounds. Sad to see as it devalues the league completely. After the excitement of European Cup action, it is back to the Guinness Pro 14 league action. This period will see squad depth charts tested to the maximum as the November test match series looms large. This weekend will see depleted first team lineups for the Welsh and Scottish sides in particular. Hawkeye Sidekick reflects on the Friday night fixtures. A depleted Scarlets squad travel to South Africa to face the Southern Kings who after two weeks without match action will be eager to get off the blocks quickly. The side selected by Scarlets is good but there is potential for the Kings to expose their visitors particularly in the front five. The hosts name an unchanged line from round six, continuity retained and it is a fixture which the South African side could pull a surprising win here. Kings by less than seven points provided that their basic fundamentals are on point. A strong Ulster Rugby lineup has being announced for this league fixture. Dragons have no less than ten changes to the side that played in round six. The quality of the Ulster Rugby back line has the potential to cause absolute havoc for Dragons. Speight returns with Addison and McCloskey also featuring. A big day for Robert Baloucoune who makes his debut, the winger is an absolute speed merchant and could be in line for a couple of try scoring opportunities. I am fearing for Dragons here. Ulster Rugby look well placed to secure a bonus point try win ahead of the November test series. Intriguing fixture awaits here. Edinburgh Rugby fresh from their comprehensive beat down of Toulon last weekend in Europe must refocus and get their away form sorted in the Guinness Pro 14. Zebre Rugby have had a good of their own; beating Bristol Bears at home last weekend. Squad depth in the closing quarter will be key and I think the visitors have the edge. Edinburgh Rugby to shade this by less than seven points. Mata is the key player for Edinburgh; his ball carrying providing the required platform. This is a key fixture for Connacht Rugby this season in the context of the Guinness Pro 14 season. The side selected by Andy Friend is strong with Aki, Marmion and Roux in the starting lineup. Ospreys are without numerous Welsh internationals and the squad depth will be tested in this fixture. The starting lineups would favor the visitors but their road trip form despite the Ulster Rugby win last time round have being a mixed bag. A difficult game to call. Connacht Rugby have had a wretched time at the Liberty Stadium but given the side named, pressure aplenty to get a result here. Connacht Rugby to secure a rare win in Swansea. If not, then questions will be asked of the side and the progress made this season. After a superb opening weekend for the Irish provinces last week (three wins and one draw), things went tougher in round two where all teams except for Munster Rugby are on their opening European Cup road trip. A weekend which should indicate plenty on how the season in Europe should pan out. Hawkeye Sidekick previews the action. 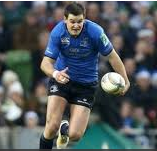 Leinster Rugby good form to continue? No disrespect to Wasps but Leinster Rugby’s first real test in Europe will be this weekend. A trip to Toulouse is always a challenge but given how Leinster Rugby are playing currently, it is a trip which the Irish province will look with confidence. Leinster Rugby team news is minimal to say the least. Rob Kearney misses out due to injury so Joe Tomane slots onto the wing while Jordan Larmour if provided sufficient time and space could destroy Toulouse from full back. It is as you were for the rest of the side which comprehensively routed Wasps 52-3 last weekend. Toulouse won at Bath Rugby last weekend on the road. Yes, they were let off the hook by Freddy Burns’ late horror show and Toulouse will be the first to admit that they got out of jail. The weather in the South-West of France in recent weeks has being horrendous; rain aplenty which should slow the pitch down significantly. The pack platform is going to be vital and Toulouse’s disciplinary issues after last weekend could come back to haunt them. Kaino is such a big loss, imposing back row whose tackle count and ball carrying are sensational. If Leinster Rugby are patient here, they will see joy in the third quarter particularly as Toulouse start to tire and give away penalties. Leinster Rugby will be asked questions out wide with the likes of Medard in the ranks but Leinster Rugby have the ability to beat you in the loose, set piece or out wide. Leinster Rugby to go away here by ten points after an opening period arm wrestle. Saturday lunchtime kickoff at Thomond Park. An opening European Cup rugby home fixture in Limerick and the venue will be buzzing. After a good draw on the road to Exeter Chiefs last weekend in stormy Sandy Park, Munster Rugby need to kick on and get their campaign fully up and running with a full eighty minute performance against Gloucester Rugby. The team news is interesting. Munster Rugby have made four personnel changes for the clash. A brand new front row is a shrewd move and reward for the likes of James Cronin and John Ryan on their cameos last week. Tommy O’Donnell as well gets the nod in the back row, his ball carrying was on point last week and setup Stander’s try. Gloucester Rugby make two changes to the side that beat Castres at home last weekend. Grobler must make do with a place on the bench and is replaced by Ed Slater. Matt Banahan replaces Charlie Sharples. The side showed good attacking cameos last weekend with Tom Marshall prominent. The key point here is the pack and who creates the platform. Munster Rugby have to start at a high tempo to allow Carbery to orchestrate his three quarters. A big game is required from Dan Goggin who needs to unleash his wide men at regular intervals. Gloucester Rugby were vulnerable on the flanks defensively against Castres last weekend at times. A fixture which Munster Rugby know that a win is required; a bonus point is attainable provided that the home side’s basic skill set is up to standard. Gloucester Rugby will look to bed in and try to stay in the contest until the third quarter; hoping that Danny Ciprani produces moments of brilliance. A trip to Racing 92 and the Arena beckons for Ulster Rugby this weekend. It was a good morale boosting win over Leicester Tigers last weekend but the level of competition this weekend is a significant upgrade. Racing 92 will look to impose their will on Ulster Rugby in the pack battle; the set piece battle has prompted Marty Moore’s introduction to the side. Kieran Treadwell comes into the lineup at the expense of Alan O’Connor. The worry is the absence of John Cooney at nine. The scrum-half has being outstanding again this season. No disrespect to David Shanahan but he will put under the cosh from the first whistle, struggling to see where Ulster Rugby create in the half-back channels and Racing 92 will look to create gain line breaks at will too. Racing 92 back line arsenal is vast. Finn Russell should see game time and then you have the likes of Simon Zebo lurking with intent. Ulster Rugby have to be completely switched on here from minute one; tempo will be sky high and the game will be uptempo given the closed roof and pitch. The Parisian side for me are one of the sides which could seriously put it up to Leinster Rugby this season in Europe. A statement of intent unfortunately may be issued at home and Ulster Rugby could feel the full force despite a positive opening period. Squad depth issues will be exposed for the Irish province. An interesting team lineup from Connacht Rugby. The term ‘youth and experience’ abound from this team sheet. A momentous day for Fitzgerald (ten) and De Buitlear (wing) who make their starting debuts for the province. Buckley, O’Halloran and Farrell return to the side to provide experience as well. This is such a key fixture in the context of Sale and Connacht’s aspirations for European Challenge Cup glory. With the French sides in this pool not genuinely interested in the competition, it is a two horse race to secure top spot in the pool. Sale Sharks have shown their intention loud and clear with a very strong team selection. McGuigan, O’Connor, Ashton and De Klerk will provide massive attacking threat. Rob Webber and Josh Beaumont will lead by example in the pack. Hopefully, the rookies in the Connacht Rugby side have good afternoons but this is a tough assignment given the selection of Sale Sharks. If Connacht Rugby can get a loser bonus point, then would be a good outcome. If you have read this blog, I have a love / hate relationship with the European Rugby Challenge Cup tournament. The concept is noble but there are glaring issues with how the format has played out in recent seasons; mismatched opposition thumped on the road, French sides for the most part not particularly interested instead focusing on domestic league affairs. Hawkeye Sidekick looks at the good, the bad and downright miserable aspects of this tournament. Obviously, it is because of the arrival of several marquee European Rugby teams. The presence of Clermont Auvergne, Ospreys, Harlequins, Northampton Saints, La Rochelle to the competition this season will see some serious playoff fixtures come next April. For now, these teams will look to go through the motions, give squad players sufficient minutes and secure their playoff berth with the minimum of fuss. When you add the likes of Connacht Rugby, Pau and Stade Francais to the mix, the business end of this competition should be superb. I am hoping also that a progressive Benetton Rugby can continue on the upward curve and look to secure playoff rugby too. The sheer indifference of some French Pro 14 sides to the competition. Who am I referring to? I am referring to the sides who are looking at a relegation scrap and decide that this competition is not a priority sending out representational sides particularly on the road. Agen last season were a case study point. Perpignan and Grenoble may go in the same direction depending how their November league form fares. It is a serious issue for the tournament organizers. I applaud the efforts of Ensei STM, Timisoara Saracens but unless there are some serious upsets, both these sides look primed for epic hammerings. What is the point and lesson for these sides having to endure heavy loss after heavy loss? I am struggling for answers. There should be a third tier competition for teams such as this and potential tournament organizer ingenuity to have developmental teams setup in Berlin, Bonn, Moscow, Madrid, Lisbon, Helsinki, Brussels, Amsterdam, Stockholm. These teams could be formed using players who are out of contract or representing countries playing in Tier Two competition. Ensei STM host La Rochelle in the early hours of Saturday morning, hopefully not a hammering but the return leg could be a 100+ point concession. Northampton Saints entertain ASM Clermont with Nigel Owens officiating. It sounds like a Heineken Cup fixture but it isn’t. Clermont made to pay for an injury plagued second half of last season finishing just far enough away from the relegation spots. Northampton Saints also had a wretched season costing Jim Mallinder his job. The performances thereafter did not improve much and the off season has seen several keynote departures. Both sides will fancy their chances of rebuilding form and confidence in this pool with Dragons and Timisoara Saracens for company. Dragons at home will rise for the visits of Northampton and ASM Clermont but squad depth issues will be ruthlessly exposed. Timisoara Saracens are cannon fodder unfortunately. ASM Clermont and Northampton to advance from this pool. A genuinely solid pool here. Pau were a side who embraced the competition and got to the last four losing away to Cardiff Blues. I have a soft spot for the team given the Munster Rugby association (i.e. Butler, Mannix). Pau will be up against it with Ospreys and Stade Francais who both look re-energized after poor seasons last year. Ospreys and Pau clash looks like a tasty pack battle. Stade Francais play Worcester Warriors and it will be interesting to gauge team lineups for each side. Warriors have had a couple of keynote domestic results but is relegation concerns going to determine team selection? Potentially one team getting out of this pool with plenty of twists and turns. Ospreys get the edge based on the fact that the French sides may cancel each other out in their home fixtures. My pet peeve on understrength team selections could rear their head in this pool. Perpignan who are propped at the bottom of Top 14 may use this competition to rest front line players for a November league push. Bordeaux Begles are infamous for sending over less than stellar match day squad so it is a straight fight between Connacht Rugby and Sale Sharks to secure top spot. Connacht Rugby have shown promise under Andy Friend and Sale Sharks have impressed this season with some key cameos particularly AJ McGinty. Connacht Rugby potentially get the edge to advance and potentially Sale Sharks as well if the French sides in this pool give up on the competition come round three. Ensei STM will be a daunting road trip for Bristol Bears, Zebre Rugby and this weekend’s opponents La Rochelle from a linguistics perspective but the playing side should straightforward. Yes, Stade Francais were upset there last season but it was an one off. 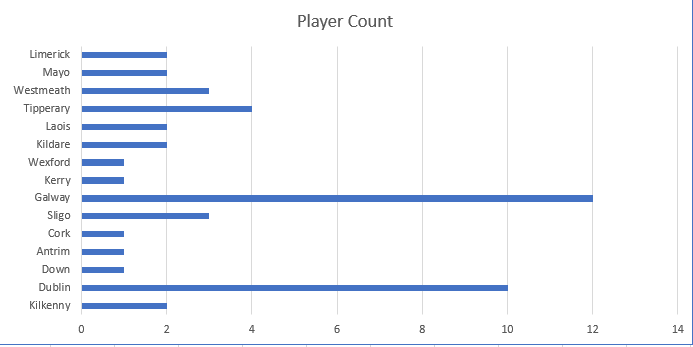 Ensei STM are five points fodder for all other pool opponents. La Rochelle look the class act in this pool with Bristol Bears potentially advancing to the last eight of the competition on the basis of the fact that they secure ten points from Ensei STM. This is a huge opportunity for Benetton Rugby to impress. The Italians are a live threat based on their Guinness Pro 14 performances. Grenoble’s ambitions in this competition are unclear and I fancy Benetton Rugby to win their opener. Harlequins and Agen face off at the Stoop and I would be shocked if Quins do not hammer Agen given the French side’s history in this competition. Harlequins to top the pool with Benetton Rugby potentially securing a playoff berth if other results go their way in January. It would be great news for Italian rugby if that happened.